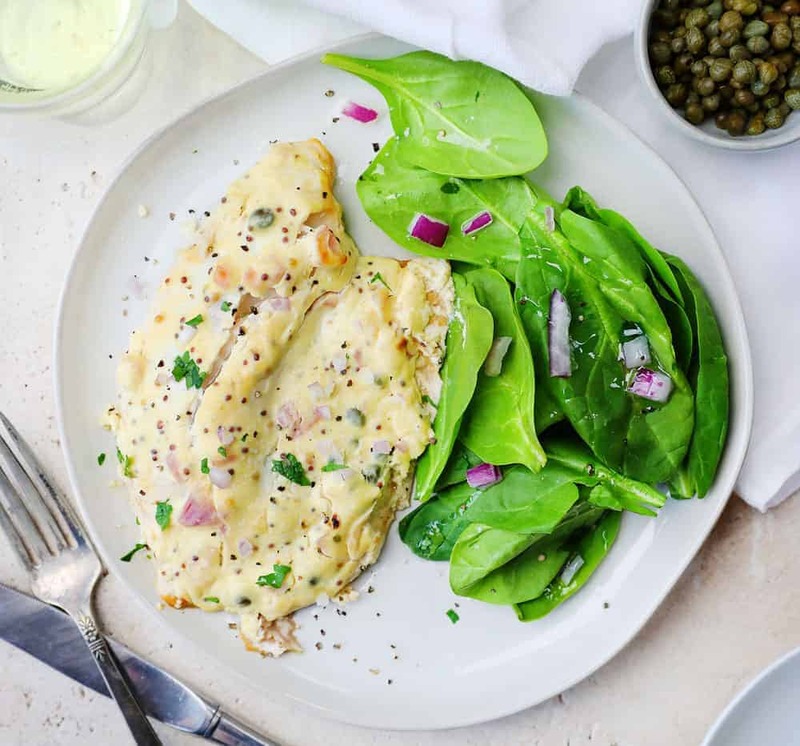 Fresh Tilapia, seasoned and baked in a creamy multi-grain mustard sauce, filled with capers and shallots. You will not believe the amount of flavor that comes from just a few simple ingredients. If you like fish you should also try my Tuna Melt Sliders! There are so many ways to make Tilapia. You can bake it, pan sear it, fry it or put it in a taco and I will eat it. Even better, so will my kids. Tilapia is a freshwater fish, that when cooked, is light and flaky with a mild flavor, which makes it great in all sorts of dishes. Fish tends to a great heart-healthy meal choice as well. This particular version falls into that category and is so very easy to make with only a few simple ingredients and it is on your table in 15 minutes flat. We love putting this recipe on the meal rotation to make sure that we have a few simple weeknight meals planned ahead. 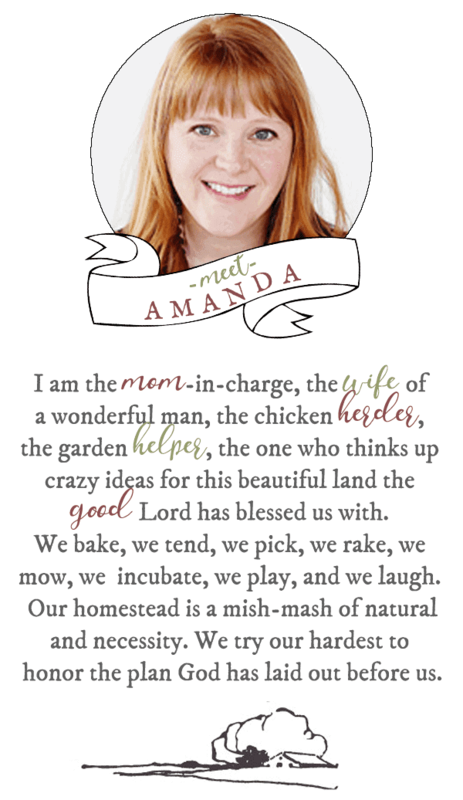 Easy weekday meals are my favorite because it means I’m spending less time in the kitchen and more time with the family. You won’t believe how easy it is to cook this tilapia recipe. Just a few simple steps and the fish on your table. Dry the Tilapia – Take the fish out of its packaging and, using a paper towel, pat it dry. It is a delicate fish so don’t put too much muscle into it. Season the fish – Using salt and pepper, lightly season both sides of the fish and then place it on a parchment lined baking pan. 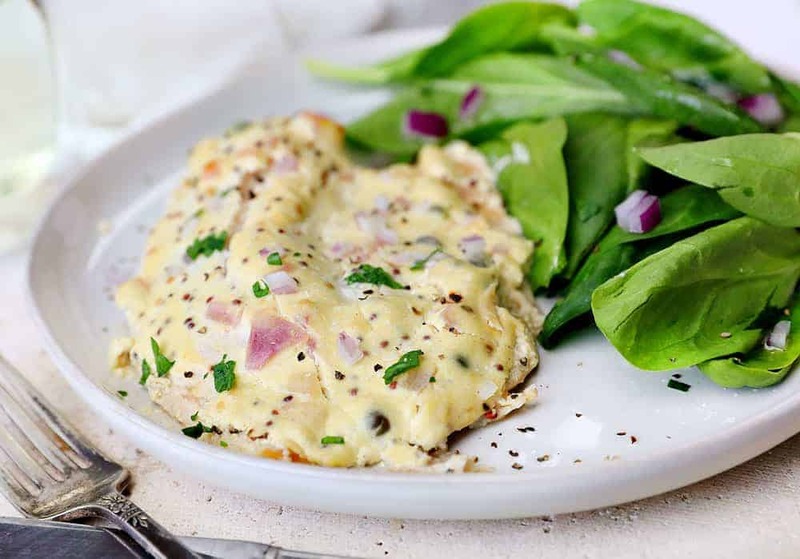 Mix the Mustard Sauce – In a medium bowl, combine the two mustards, sour cream, shallots, and capers. Depending on how you feel about texture, you may want to chop these up a little smaller. Personally, I like the grainy texture. If that isn’t you, you could always put all of these ingredients into a food processor and pulse a few times to break the sauce up a bit more. 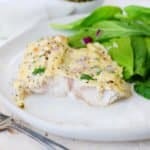 Pour the mustard sauce over the fish (make sure it is completely covered) and then pop it into the preheated oven for 10-15 minutes. Freshwater fish like Tilapia will be easily “flaked” when it is done. However, if you are looking for a more precise method of knowing when your fresh catch is ready to eat you can follow any one of these methods. Cooking time always depends on the thickness of the fish. Tilapia tends to be a thinner fish, with an even thinner area around the tail. 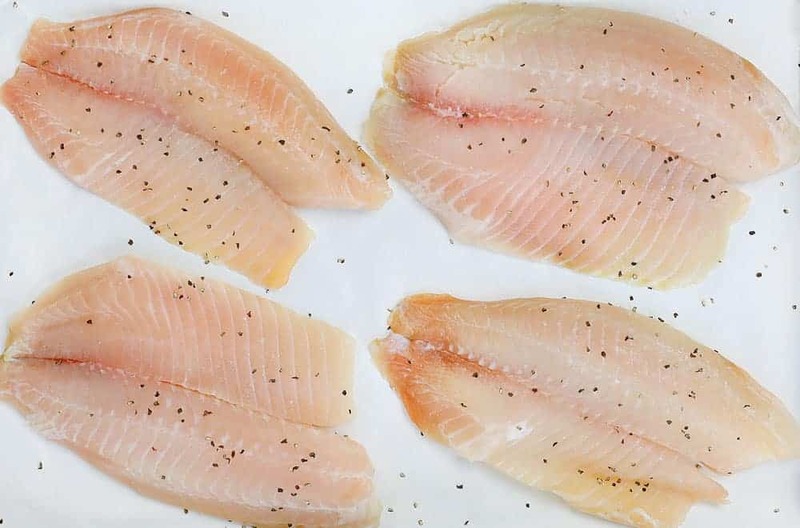 These three methods can be used to know if your Tilapia is done. The Meat Thermometer: If you have a meat thermometer, the center of your fish should reach 145 °F. The fork test: The fish should be opaque, not translucent and it should break easily into flakes when you nudge it with a fork. The 10-minute rule: For this, you measure the fish at its thickest point and cook it for 10 minutes per inch. Line a sheet pan with parchment paper. Place the fish fillets skin side down and season with salt and pepper. For the mustard sauce, combine the sour cream, dijon mustard, whole-grain mustard, shallots, capers, salt, and pepper in a small bowl. Spoon the mustard sauce onto the fish until it is completely covered. 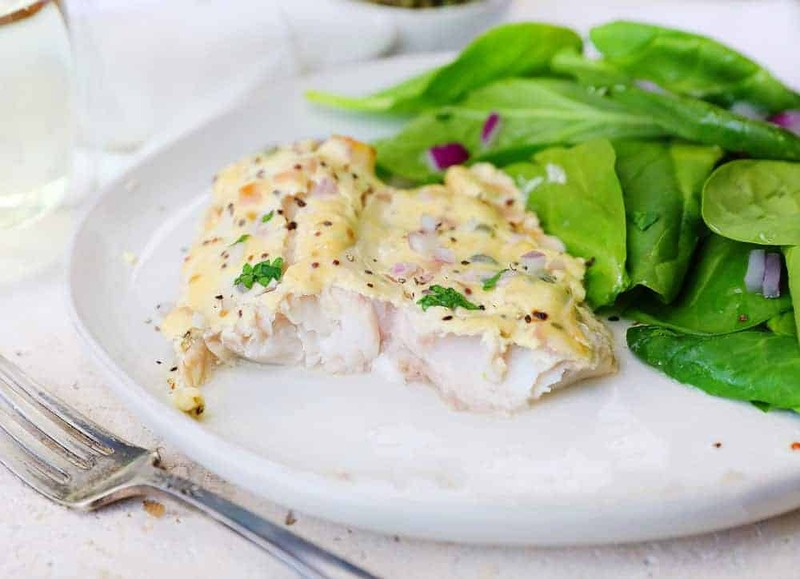 Did you make Roasted Tilapia with Mustard Sauce?